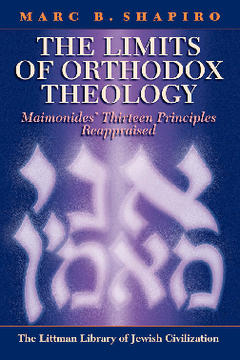 It is commonly asserted that Maimonides' famous Thirteen Principles are the last word in Orthodox Jewish theology. This is a very popular notion, and is often repeated by scholars from all camps in Judaism. Yet such a position ignores the long history of Jewish theology in which Maimonides' Principles have been subject to great dispute. The book begins with a discussion of the significance of the Principles and illustrates how they assumed such a central place in traditional Judaism. Each principle is then considered in turn: the reasons underlying Maimonides' formulations are expounded and the disputes that have arisen concerning them are discussed in detail. Marc B. Shapiro's authoritative analysis makes it quite clear that the notion that Maimonides' Principles are the last word in traditional Jewish theology is a misconception, and that even Maimonides himself was not fully convinced of every aspect of his formulations. Although structured around Maimonides' Principles, this book can also be seen as an encyclopedia of traditional Jewish thought concerning the central issues of Jewish theology. The diversity of opinion in Jewish tradition on such issues as God, Creation, and the Revelation of the Torah is sure to surprise readers. Marc B. Shapiro holds the Harry and Jeanette Weinberg Chair in Judaic Studies at the University of Scranton, Pennsylvania. A graduate of Brandeis and Harvard universities, he is editing the collected writings of Rabbi Jehiel Jacob Weinberg, the first volume of which appeared in 1998, and the second in 2003.